Password protection allows you to prevent unauthorized persons from performing certain actions with the document. Without the password, a user cannot open the document or is not allowed to edit, print or comment the document. To protect a PDF document with a password, open the PDF document you want to protect, then click the File > Properties menu. This will bring up the Document Properties window. Switch to the Security tab. By default, a PDF document uses no encryption. Click the dropdown box and select Password encryption there. A new window will pop up, Password Security. PDF documents can be encrypted with two types of passwords. The first one is a password to open the document. If you just want to share the document with another person and don’t want others to be able to open it, you most likely need a password to open. The second type is a permission password. A permission password allows only the selected actions and prohibits all others. So, for instance you may create a password that allows viewing and commenting the PDF document, but does not allow printing or editing. Enable the Requires a password to open the document option in the Password Security window. Then enter the password in the first box and re-enter it in the second box. Click OK to save the security settings. Enable the Permissions option in the Password Security window. Enter the password in the first box and re-enter it in the second box. Then select actions that are permitted. Deselected actions will be disabled in this PDF document. Click OK to save the security settings. 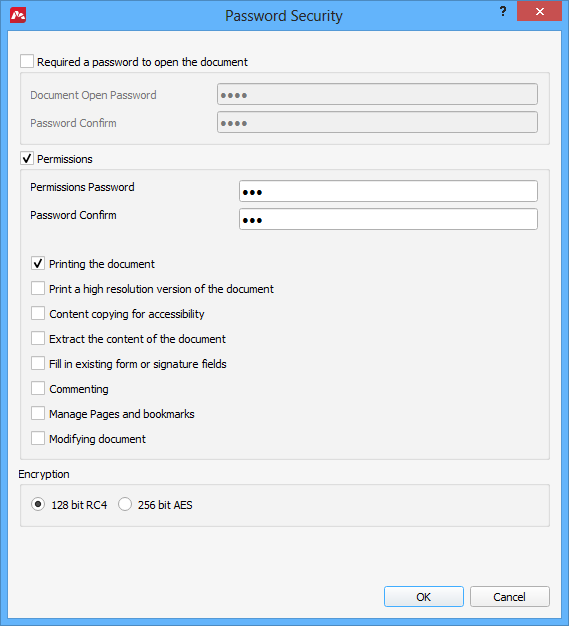 Now, changing permissions of this document will prompt for the correct permission password. IMPORTANT: unlike the password to open a document, a permission password does not actually encrypt the data in the PDF document. Hence, it is still possible to open the protected document in a third-party application and perform all the disabled actions as long as that software disregards the permission password. You can select between 128 bit RC4 and 256 bit AES algorithms. Both provide firm security for your documents when using a password to open the document. 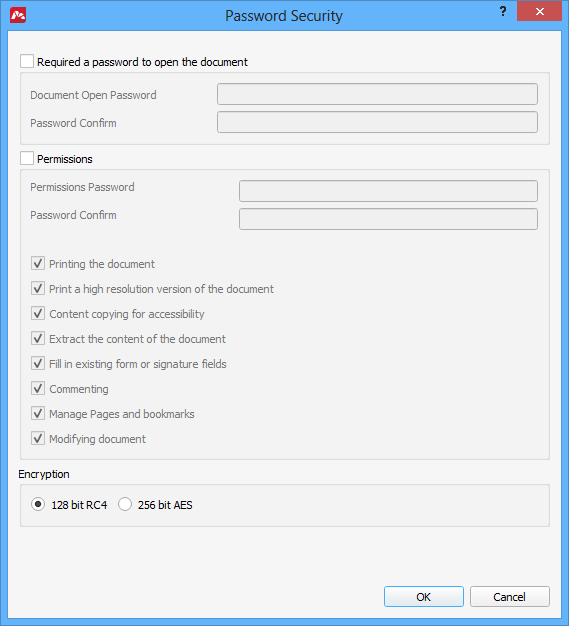 Note: 256 bit AES encryption requires Acrobat 9 or higher compatible application to read it.